(Newser) – A Revolutionary War hero dubbed the "father of the American cavalry" may well have been female or even intersex, if new research holds up. 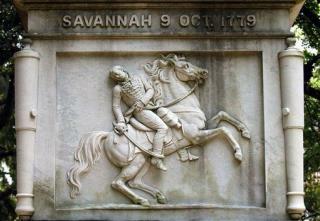 Experts analyzing the DNA and bones of Casimiar Pulaski—a Polish-American soldier who was fatally wounded in the 1779 Siege of Savannah—say the skeleton looks conspicuously female. "One of the ways that male and female skeletons are different is the pelvis," Georgia Southern University Professor Virginia Hutton Estabrook tells NBC News. "In females, the pelvic cavity has a more oval shape. It's less heart-shaped than in the male pelvis. Pulaski’s looked very female." Others had spotted Pulaski's feminine bone structure before, but without DNA confirmation no one could say it was really Pulaski. Next on Newser: Lightning Strikes for Shazam! This bit of revisionist history is brought to you by the LGBT Alliance . Send contributions to; Caligula LLC, PO Box Pervert, New York. For the people that are interested, the Smithsonian Channel, as mentioned in the article, offers a seven day, free trial to watch any and all of the films that the Smithsonian has uploaded to its' website. If a person has access to the Smithsonian Channel via their TV service provider, they can also watch the films at the same website. it leaves just one super duper important question... what bathroom did he use?